Baby Milk Action is part of the International Baby Food Action Network (IBFAN), consisting of over 270 groups in more than 160 countries. IBFAN groups monitor company activities on the ground. Globally, IBFAN’s International Code Documentation Centre produces summary reports rounding up violations by the major breastmilk substitutes and feeding bottle and teat companies. These are produced every three or four years, the last report being Breaking the Rules, Stretching the Rules 2014, which we presented in Geneva prior to the World Health Assembly in May 2014. IBFAN monitors baby food companies against World Health Assembly marketing requirements. I have just been contacted by Nestlé Global Public Affairs Manager with the company’s long overdue response to IBFAN’s 2014 monitoring report. Nestlé’s response will be a disappointment to anyone familiar with the marketing rules that Nestlé should follow as it shows Nestlé continues to treat these measures with contempt, putting its own profits before the lives and well-being of babies. As I will explain. Nestlé knows its response is inadequate, but it hopes that non-experts will accept it at face value, particularly those who want to be convinced that it is fine to invest in Nestlé, work with it or take its sponsorship. It is worth reading the paper Engineering of Consent by Judith Richter to understand the public relations strategy Nestlé has developed to try to counter criticisms and continue with business as usual – these have become a model for other corporations facing calls to change harmful practices. The fact is, Nestlé continues to endanger health. And its strategies come from the very top of the company (see below for how Nestlé’s Chairman responds when I raise violations with him directly). Despite its response, Nestlé will continue to promote its formula with the claim it “protects” babies, for example, though executives know that babies fed on formula are more likely to become sick than breastfed babies and, in conditions of poverty, more likely to die. It will continue targeting health workers with gifts and sponsorship to endorse its products. And it will continue making contact with pregnant women and new mothers, and advertise baby milk brands. Where it has made changes, such as agreeing to stop promoting its formula with the claim it is the “natural start” this has come about as a direct result of a campaign by supporters of the Nestlé boycott. The consumer boycott of Nestlé consumer products (such as Nescafé coffee, KitKat and the rest) remains essential, alongside the work we and our colleagues are doing to strengthen and enforce regulations to hold corporations to account. These are strategies that demonstrably work. Those who want to be convinced by Nestlé will probably read no further. But if you want to understand how Nestlé misrepresents the marketing requirements it should follow and see what it is actually doing on the ground, read on. The Breaking the Rules 2014 report documents Nestlé practices, such as promoting Nan HA formula on its Chinese-language website based in Hong Kong with the claim: “OPTI PRO quality protein helps enhance immunity”. It also encourages mothers to join the baby club to receive gifts, discounts and samples. Nestlé’s response simply ignores these violations – because it fully intends to continue with them. 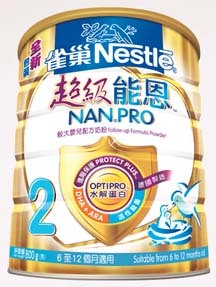 I’ve checked the Nestlé Hong Kong website just now, and Nestlé continues to promote Nan HA with its bogus “OPTI PRO” and “protect plus” claims. These imply benefits to the formula and so undermine breastfeeding – and they are Nestlé’s responsibility. 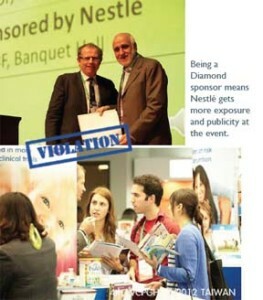 Nestlé has nothing to say about the sponsorship of health workers exposed in the Breaking the Rules 2014 report, such as at the 4th World Congress of Pediatric Gastroenterology, Hepatology and Nutrition in Taiwan (left). ‘As Clinical Network Representative, your role is to work on the designated territory, visiting hospitals, doctors, health visitors and community midwives to develop key clinical relationships within your local health Economies, leading to opportunities for the SMA brand and Nestlé Nutrition. In the UK, many health facilities prohibit company representatives from meeting with staff, restricting them to providing scientific and factual information to a designated expert for assessment. So Nestlé holds its own events at nearby hotels and attempts to entice the staff along with refreshments and guest speakers – where it will promote its infant formula products, seeking brand endorsement. Since Nestlé’s entry into the UK marketing is becoming markedly more aggressive as we see the tactics used around the world used here. The report exposes the way Nestlé representatives gain access to health facilities, using gifts such as height measurement charts in Laos and cot identification cards in Singapore, promoting the Nestlé Nutrition slogan ‘Start Healthy, Stay Healthy’. The new feature film Tigers dramatises similar strategies in Pakistan, based on the true story of a Nestlé salesman who resigned and blew the whistle on the company after learning of babies dying from unsafe bottle feeding. Check our special Tigers page for news of where you can see the film. 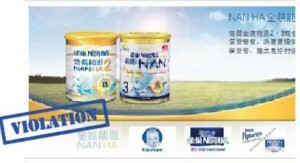 Nestlé also targets pregnant women and mothers directly and advertises formula brands (see below). Remember, it is not only Baby Milk Action and IBFAN that are critical of Nestlé’s practices. For example, the Methodist Church Conference received a report from its ethics committee in June 2015 also showing Nestlé systematically breaks marketing rules. Our supporters in the UK will be familiar with our work supporting the public to monitor and report cases to Trading Standards for enforcement action and the industry-run Advertising Standards Authority. We have won cases specifically against Nestlé’s misleading marketing of its SMA brand. We also raise concerns directly with companies. ‘You talked about Breaking the Rules. We are currently analysing this report and we will be posting all answers to these questions on our website. I had to inform shareholders a year later at the meeting on 16 April 2015 that the promised report had still not been posted to the Nestlé website or sent to IBFAN. Nestlé Global Public Affairs Manager contacted me last week (10 July 2015) to say the response has finally been posted. We will be respond to Nestlé in writing as part of our on-going communication with the senior executives of the company at its headquarters in Vevey, Switzerland. We have this access thanks to your support for the campaign – Nestlé listens and responds, even if its responses demonstrate an unwillingness to make required changes. Anyone with an understanding of the World Health Assembly Resolutions will quickly see why the Nestlé report is a whitewash. Nestlé simply does not accept the validity of the minimum marketing standards adopted by the World Health Assembly, specifically the International Code of Marketing of Breastmilk Substitutes and subsequent, relevant Resolutions. This reflects the text of Resolution 34.22 under which the Code was adopted. Its provisions are minimum requirements that apply in their entirety to all countries. 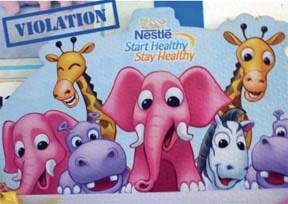 Yet Nestlé’s analysis of the violations found by IBFAN is not against the Code and Resolutions. According to Nestlé: “Nestlé must follow the WHO Code as implemented by national governments” (emphasis added). Not true. Article 11.3 is clear that companies must abide by the Code “independently of any other measures taken for implementation of this Code”. We have been calling on Nestlé to accept its responsibilities for decades. Looking to government implementation is insufficient as they are under pressure by Nestlé and other companies not to fully implement the measures (Zimbabwe’s Health Minister, for example, accused Nestlé of “economic blackmail” in threatening to withdraw from the country if the government introduced strong measures). 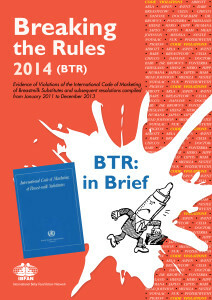 Only about 35 governments have fully implemented the Code and Resolutions in legislation. This is why the Code and Resolutions must be respected as minimum standards everywhere “independently of any other measures taken for implementation of this Code” (I’m repeating it, because Nestlé needs to be reminded until it accepts this point). Nestlé’s Policy and Instructions are weaker than the WHO Code. This is documented in the Breaking the Rules 2014 report. Nestlé ignores this fact, instead boasting that it is the only baby milk company in the FTSE4Good ethical investment index, but FTSE4Good prompted Nestlé to weaken its own policies. Prior to joining FTSE4Good, Nestlé said it would not advertise or promote brand names used for infant formula (e.g. Nan, Lactogen). Under the FTSE4Good criteria companies are assessed against their own policies, rather than the Code and Resolutions. So before being admitted, Nestlé changed its policies saying it would not advertise or promote products for use up to 12 months of age with the same brand name as infant formula. This opened the door to it promoting follow-on milks and so-called toddler milks for babies older than 12 months with infant formula brand names. The example from Armenia – which Nestlé refers to as a “high risk” country – shows the cross promotional nature of this strategy. Nan is advertised on television – with the slogan “reliable protection for children” – but Nestlé will claim its policy is not being broken because the Nan tin has a number 3 on it. 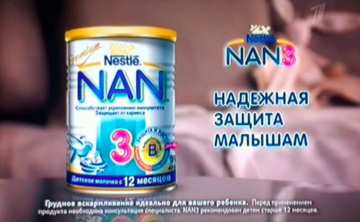 All the same, it is promoting the Nan brand. 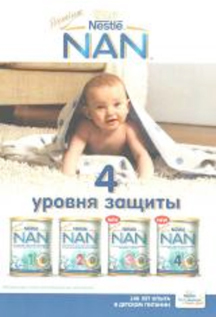 The promotional pamphlet for the range in Armenia shows, the infant formula is identically branded. Again, this was included in the Breaking the Rules 2014 report, but Nestlé’s response ignores it. The boycott has forced some changes in Nestlé’s policies. For example, for many years it refused to abide by WHA Resolutions on the importance of exclusive breastfeeding for the first 6 months of a baby’s life. Nestlé promoted complementary foods (i.e. purées, juices and other baby foods) for use from 4 months of age or even earlier. It took a 9-year campaign to prompt a change in Nestlé’s policy – which it announced during a week of demonstrations at its factories and offices across the UK (claiming with typical shameless public relations spin that it was “taking the lead”). 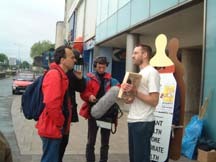 So when Nestlé states in its report, “we also do not market complementary foods for children under six months of age”, it is important to remember that it took many people monitoring and exposing Nestlé’s contempt for the Resolutions, working for binding regulations and taking to the streets to force this change (the demonstration at Nestlés UK HQ was filmed by Swiss Television). Nestlé’s call for a “collaborative approach to promote and support breastfeeding” should be seen in this context: it shows no willingness to bring its policies and practices into line and only acts when forced to do so by enforced regulations or civil society campaigns. Unfortunately the ASA rules do not apply to Nestlé public relations materials such as this new report or we would be able to challenge it again with the latest evidence. Nestlé boasts of its inclusion in the FTSE4Good ethical investment index, while dismissing 90% of the violations in the Breaking the Rules 2014 report. Yet, as a recent ethics committee report to the Methodist Conference sets out, FTSE weakened the FTSE4Good criteria because Nestlé and other companies were not complying and it wanted to bring at least one into the index. 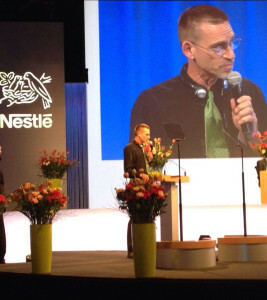 It was the criteria that changed, not Nestlé’s practices. The criteria look to company policies rather than the Code and Resolutions. So, as the ethics committee report explains, Nestlé weakened these policies in 2010 prior to being admitted to the index, knowing these would be the benchmark. FTSE has asked Nestlé repeatedly not to suggest inclusion in FTSE4Good signifies compliance with the WHO code. Our full analysis of FTSE4Good shows how organisations such as Save the Children and UNICEF Laos have called on FTSE to bring its criteria into line with the Code and Resolutions. In reality, FTSE4Good provides a public relations smokescreen for Nestlé, while its only demonstrable impact has been to prompt Nestlé to weaken its own policies. Nestlé’s plea for collaboration should be seen as self-serving, when it rejects 90% of violations reported to it and refuses to accept the Code and Resolutions as minimum requirements for all countries. Nestlé must state in writing that it accepts that the International Code and the subsequent, relevant World Health Assembly Resolutions are minimum requirements for every country (instead of adding “as implemented by national governments”). Nestlé must state in writing that it will make the required changes to bring its baby food marketing policy and practice into line with the International Code and Resolutions (i.e. end its strategy of denial and deception). Baby Milk Action will take the statements to the International Nestlé Boycott Committee and suggest that representatives meet with Nestlé to discuss its timetable for making the required changes. If IBFAN monitoring finds no Nestlé violations for 18 months, the boycott will be called off. As Nestlé has still not complied with points 1 and 2, the ball is in its court. The announcement is actually contained in a letter from Nestlé to me, dated 14 October 2014. This was sent within a week of a campaign we ran exposing the misleading “Natural Start” claim during Nestlé’s prestigious Creating Shared Value Global Forum. People retweeted our tweet, so it became featured on the Twitter page for the event, so showing viewers that what Nestlé says and what Nestlé does are different things. So please do keep supporting our campaigns and spreading the word. You can also help by reporting cases of aggressive Nestlé marketing to us (the “SMA” brand if you are in the UK). Joining, donating and buying items from our online Virtual Shop also support the campaign. So weird, the NAN in South Africa has in the front that breast milk is best for baby and that the product does not contain any. 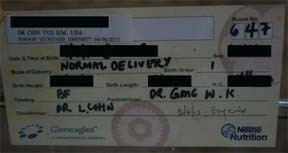 Luckily our hospitals and clinics promote breast feeding over formula for the first year of baby’s life.